Channel your inner musician with Jim Beam Bourbon Beats! This app is your own music mixer in your pocket. Create the music you want to hear and share it with your mates. There’s thousands of party, rock and soul beats to be created, so get mixing. - Mix your beats – it’s that easy. - Record your sets and share them to Facebook. 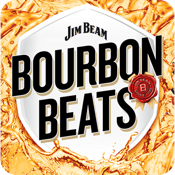 - Scan more cans and collect more sounds by purchasing a specially marked Jim Beam Bourbon Beats 24 pack in store to build up your deck and create more mixes. Each can has three sounds to mix – and with 12 cans and three levels in the deck, your track list is endless. Share, learn, up beat, listen and create mixes with or against your mates around the world. So get creative, let your inner DJ out and start creating wicked tunes on Bourbon Beat’s mixing deck. Practice makes perfect, the more you play the more you mix and the more you share the better you’ll get. This app gives you the tools to become a DJ on the bus, at work, at home, on a plane, at dinner – anywhere! Your skills are limitless with Bourbon Beats. Play it loud or whack in some headphones and get mixing for hours. The only thing holding you back is your phone’s battery. Create rock, dance, hip hop, techno – whatever you want. That’s the beauty of this app, you mix, record and share your own tracks. Bourbon Beats is easy to use, fun to share and a blast to play. So mix it up now! MUST BE 18 YEARS AND OLDER TO USE. 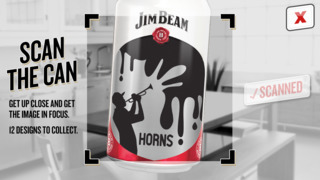 Only cans from Jim Beam Bourbon Beats 24 packs can be scanned into app. Scanning times may vary depending on quality of camera and device.